This is the same Commercial Grade your local Cable TV company uses to get from the Telephone Pole to your House. Our Customers use this in MHP Hotel Motel SMATV Cable TV, Video Surveillance and Hi Speed Internet Systems. It Features CCS Center Conductor, Dialectric Foam, Bonded Laminated Aluminum Tape inner Shield, 77% Braid Shield Middle Layer, Outer 3rd Layer of Laminated Aluminum Tape, 0.051 inch Steel Messenger, all encased in a Outer UV Resistant PVC Jacket. 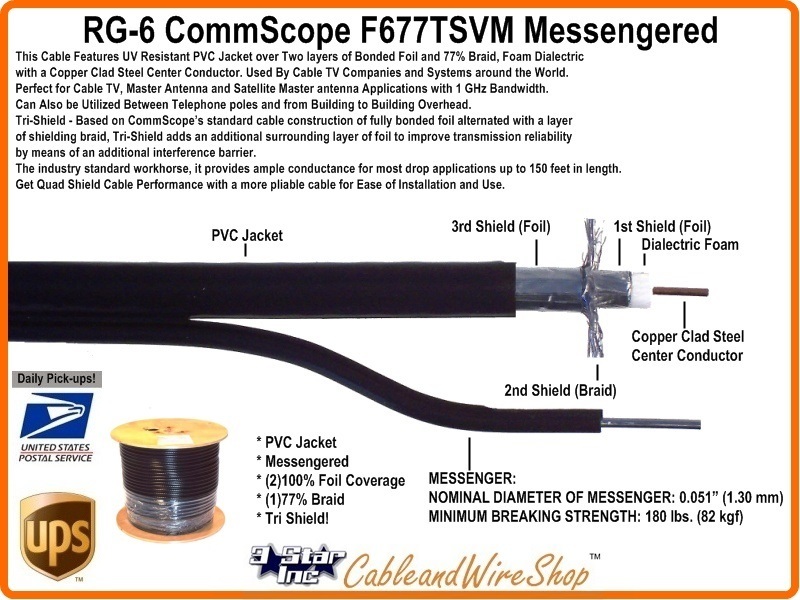 Tri-Shield - Based on CommScope's standard cable construction of fully bonded foil alternated with a layer of shielding braid, Tri-Shield adds an additional surrounding layer of foil to improve transmission reliability by means of an additional interference barrier. The industry standard workhorse, it provides ample conductance for most drop applications up to 150 feet in length. Note: This is the same Commercial Grade Low Loss Cable your local Cable TV company uses to get from the Telephone Pole to your House. Our Customers use this in their MHP Hotel Motel SMATV Cable TV, Video Surveillance and Hi Speed Internet Systems to distribute around Properties in short run segments. Mobile Home Parks- Where they are Administrating their own Cable TV or SMATV System with Aerial Outside Plant running on the same Pole line that feeds Telephone and Power to the Lots. Aerial is cheaper to install and easier to maintain. Along these same Pole lines, Modulated Security Camera feeds run through this cable, each independantly from a camera to a Central Location for further processing and recording. Once processed and combined as TV channels along with the others offered, they distribute these Camera Feeds for residents to monitor their guests and service appointments arrivals and departures, sharing the Security Responsibility with all. Small Apartment, Condominium, Hotel and Motel Complexes not only use this cable for Strategically placed Security Camera Feeds from the Roof of the Building(s), but as a very economical means of MATV Antenna Installation. Where the managers of the Property may have provided Cable TV or Satellite (SMATV) systems on the Properties, some Tenants may not be able to afford it, having One Antenna on the roof to feed those residents opting for Free Off-Air TV beats having several located on the Balconies. Antenna Reception may not be equal at any location on the Property, and only one or several locations my be deemed sufficient in Signal Quality or Asthetics concerns. Building to Building Coaxial Cable Feeds run aerially may be the answer if it is limited to one cable run point to point strategically as not to detract from the ambience. The same Antenna location issues are faced by Home Property owners Large and Small. There may be only one location not blocked by Trees or other buildings to locate the Antenna, and of course, the signal is needed some place else. Again, Aerial Placement of Coaxial Cable feeds is cheaper than Underground Placement.